The corporate value of more than 6 out of 10 firms in which South Korea's state pension operator invests has risen since its introduction of the so-called stewardship code in late July, a report said Friday. The National Pension Service (NPS) adopted the stewardship code on July 30, which refers to a set of principles or guidelines aimed at making institutional investors active and engaging in corporate governance in the interests of their beneficiaries. 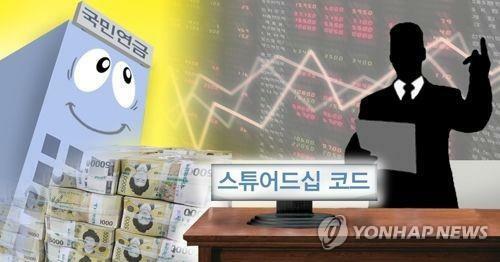 According to the report by the Korea Corporate Governance Service, nearly 62 percent of the 194 companies, in which the NPS had stakes of 5 percent or more as of end-December, posted positive excess returns, or the rate of return that exceeds what was expected, for three business days beginning July 30. Their average excess returns stood at 0.82 percent for the three-day period. The average excess returns of the 75 firms that the pension operator owned 10 percent or more in reached 1.13 percent, with more than 65 percent recording positive figures. "The results indicate that the introduction of the stewardship code has had a positive impact on the corporate value of NPS-invested companies," said Kim Hyung-suk, who authored the report. "It can also be seen as signaling that market participants harbor positive expectations about the NPS' role as a major institutional investor." The NPS introduced the stewardship code in an effort to help improve corporate governance in South Korea, one of President Moon Jae-in's election pledges.